You may ask what is coca tea. Well,coca tea is an herb (made like other teas) using raw leaves from the plant. The coca leaf is a native plant to South America. The tea is most known and used near and in the Andes mountain range reason being is because it helps with altitude sickness amongst being plentiful in vitamins. The coca plant is known for its high alkaloid (natural occurring chemicals) contents. Making coca tea a mild stimulant, this is comparable to coffee. The coca plant is what is used to make cocaine, but remember cocaine is also made with many other chemicals and remedies such as baking soda and gasoline and you don’t see those getting banned. In the year of 1995 the who did what is known as the largest global study on cocaine use. Where they came to the concluding fact that the use of coca leaves has had no negative health effects and has had positive therapeutic sacred and social functions for the Andies population. In 2009 the government of Bolivia amended the 1961 single convention law which banned the use of coca leaf. 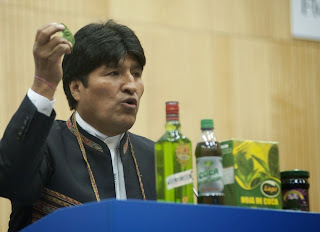 They tossed out article 49 which banned all use of chewing coca leaf. Of course the US followed up and objected their amendment. In 2011 Bolvia finally got rid of the single convention which took full effect in 2012. Bolivia receded the treaty in 2013.